Niccolo Tartaglia had one of the worst childhoods of any of the scientists whose lives we have considered. He survived to make important contributions in physics, with his book New Science launching the modern science of ballistics; and in mathematics, where he provided general solutions for cubic equations. Tartaglia refuted Aristotle’s claim that air sustained motion, saying that air resisted motion. He was the first to say that projectile physics should be studied under conditions where air resistance is insignificant. His work with projectiles and his translations of the works of Euclid and Archimedes into Italian paved the way for Galileo’s great discoveries in the early 1600s. Niccolo Tartaglia was born in the northern Italian city of Brescia in 1500. His birth name was Niccolo Fontana, but – as we’ll see – he would become known as Tartaglia following a horrific attack he suffered in his childhood. Niccolo’s family – he had an elder brother and younger sister – were not well off. His father, Michele Fontana, earned a modest living carrying messages and deliveries on horseback between merchants and noblemen. The family lived in dangerous, unstable times. When Niccolo was six, his father was murdered by robbers, leaving his mother struggling to cope with extreme hardship. For the citizens of Brescia worse was to come. In 1512, when Niccolo was 12 years old, there was a genocidal attack on Brescia by a French army led by Gaston of Foix. The city, although lightly defended, had refused to surrender to the French, who were trying to conquer northern Italy. Gaston of Foix’s army soon captured Brescia, then sacked the city heinously and without mercy. In the space of three days, 8,000 civilians – about a quarter of the city’s population – were butchered – often gruesomely. Many of the survivors were left with terrible wounds – physical and psychological. Niccolo and his family had sheltered in the cathedral, but even there they found no sanctuary; soldiers forced their way in. One of the soldiers attacked Niccolo, striking five savage sword blows on the terrified boy’s face and head, moving on to another target only when he thought the boy was dead. Niccolo, however, clung to life. His mother had no money to pay a doctor to treat her son’s terrible wounds. She treated him based on her observations of dogs: wounded dogs lick their injuries. She cleaned Niccolo’s wounds frequently with great care – in fact she worked with more regard for observational science than surgeons more than three centuries later would. Niccolo became known as Tartaglia – from the Italian word meaning ‘stutter’ – because of the difficulty he had speaking. 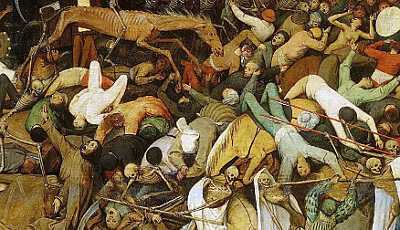 A small scene from Pieter Bruegel’s The Triumph of Death painted in 1562, inspired perhaps by the horrors visited upon some European cities in the 1500s. At age 12, life for Tartaglia must have been harsh; he did not yet have a beard to hide the injuries that made him “look like a monster.” He was not alone, however; many other survivors living in Brescia were also learning to live with permanent disfigurement. He was too poor to afford school, but got a few weeks free schooling. He kept a book that he should have returned to the school and taught himself to read. He also began showing a remarkable gift for calculations. Recognizing her son’s unusual ability, his mother came to his aid again. She found a wealthy benefactor, Lodovico Balbisnio, who took Tartaglia to the university town of Padua to study. Tartaglia did not study for a degree, but he learned enough in Padua to become a powerful mathematician. His ego seems to have become dreadfully inflated at this time. When he returned to Brescia from Padua he is said to have behaved arrogantly and treated people rudely. Unsurprisingly, he began feeling rejected by the people of his hometown. At about the age of 20, he moved to the city of Verona, where he taught mathematics privately – private teachers gave commercially oriented lessons to engineers and merchants on subjects such as methods of measurement, bookkeeping, currency exchange, etc. At age 34 Tartaglia relocated again, this time to the great merchant city of Venice, teaching mathematics both publicly and privately. As a private teacher, Tartaglia needed customers and became a master of self-promotion. He showed off his expertise whenever he could, involving himself in disputes and competitions where he could demonstrate his superior skills. 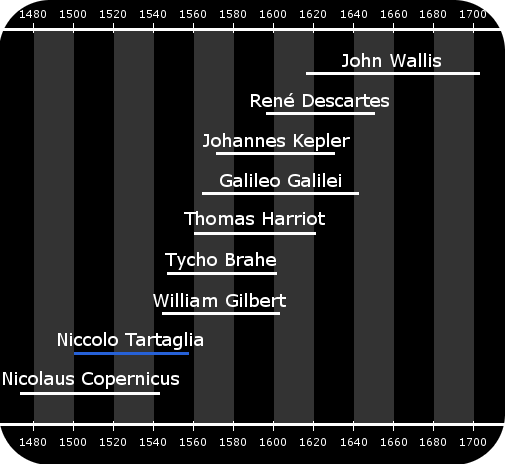 Tartaglia’s lifetime and the lifetimes of related scientists and mathematicians. In 1535, soon after settling in Venice, Tartaglia became famous throughout Italy – or as famous as a mathematician can be – by winning a competition. In Tartaglia’s time, anyone who had learned mathematics knew how to solve quadratic equations – equations of the form ax2 + bx = c.
However, equations involving x3, cubic equations, were a whole different ballgame. Finding a general solution – a way to solve all cubic equations – had defied the efforts of every mathematician who had ever attempted it. Tartaglia, on the other hand, had discovered how to solve cubics in the form x3 + ax2 = b. They became involved in a dispute and Fior challenged Tartaglia to a competition, to decide which of them was the better mathematician. Each mathematician had to solve cubic equations posed by the other. Sadly for Fior, he could not solve the problems in the form x3 + ax2 = b Tartaglia gave him. Tartaglia, on the other hand, in preparation for the competition, had discovered how to solve any cubic equation. He quickly completed all the problems Fior gave him, winning both the competition and a high reputation. He kept his method secret, intending to publish it himself at a later time. A mathematician by the name of Girolamo Cardano persuaded Tartaglia to tell him the solution, promising not to publish it. He actually published it six years later, giving credit to Tartaglia. Nevertheless, Tartaglia never forgave Cardano for what he saw as a betrayal. The most famous Italian scientist in history is Galileo Galilei. Galileo was born seven years after Tartaglia died. In the early 1600s, Galileo created the new physics, becoming the father of modern science. He achieved this by crushing the deeply flawed physics Aristotle constructed two millennia earlier. Tartaglia’s work provided an important bridge between Aristotle and Galileo. In 1537, 27 years before Galileo was born, Tartaglia published a book, the New Science, and in doing so founded modern ballistics – the science of projectiles. Tartaglia’s name was already known in Italy because of his victory in the cubic equations competition, and his book was an instant hit, quickly running to six editions. Galileo owned a copy of the New Science. The New Science was a very early example of mathematical physics – Tartaglia attempted to utilize mathematical axioms in the style of Euclid to explain the physical world. Tartaglia had started thinking about ballistics five years earlier, when a soldier asked him a question: what angle should a cannon make with the ground to achieve the maximum shooting range? Tartaglia used geometry to answer the question: 45 degrees. He then began a more careful study of ballistics, and in doing so powerfully affected the future development of physics. Part of the frontispiece of the New Science. Euclid is shown allowing people to pass through the gate of knowledge. Those who cheated by not studying Euclid, like the man on the ladder, would not enter the stronghold of knowledge. Two influences – both originating in Ancient Greece – are obvious throughout Tartaglia’s New Science: the geometry of Euclid and the physics of Aristotle. Tartaglia employed the eternally correct geometry of Euclid to analyze motion, but could not make a clean break from the eternally incorrect physics of Aristotle, leading to some confusion and errors. 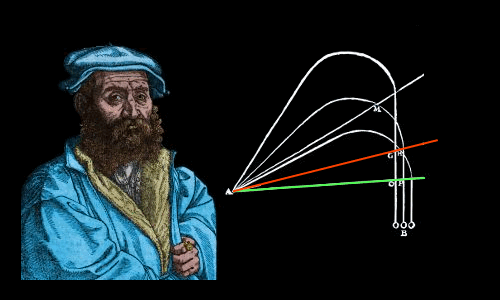 For example, although Tartaglia identified that a projectile’s path is a continuous curve – he was the first to do this – he choose to analyze the movement mathematically as a straight line, followed by the arc of a circle, followed by a straight line. In doing so he was faithful to Aristotle’s incorrect belief that there were two types of motion – violent and natural. Tartaglia’s projectile path consisted of: AB – a straight line; BC – the arc of a circle; and CD a straight line. He applied his calculations to paths like this. He stated, however, that a projectile actually follows a path that is a continuous curve. It was left to Galileo who, with profound experiments and interpretations, proved that Tartaglia’s continuous curve is actually a parabola. 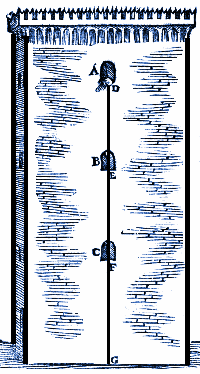 Galileo scrapped Aristotle’s violent and natural motions, replacing these with motion separated into a horizontal part and a vertical part. Galileo proved that projectiles follow parabolic paths. 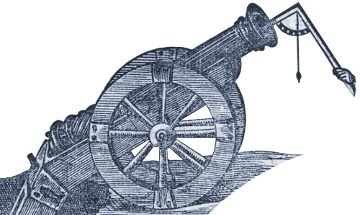 From the scholar’s point of view, he saw that by measuring angles and correlating them with the motion of the cannonball, gunnery problems could be attacked using mathematical theory. From the gunner’s point of view, he saw that when lessons had been learned from mathematical theory, they could put to practical use. Using a quadrant to measure a cannon’s angle of elevation. It was also important that Tartaglia’s work was repeatable – firing cannonballs produced more reliable data than, say, throwing a ball from your hand. Tartaglia said that a cannonball dropped from a tower would accelerate; the greater the time the ball fell for, the greater the speed it would reach. The image shown here of a cannonball dropping from a tower is taken from Tartaglia’s New Science. Legend has it that Galileo timed cannonballs falling from different heights on the Leaning Tower of Pisa, making the momentous discovery that the distance traveled by an object in freefall is directly proportional to the square of the time it has been falling for. Aristotle had claimed that air is required to sustain motion. Tartaglia disagreed. He said motion is resisted by air. Although he was not the first to suggest Aristotle was wrong, Tartaglia then made a conceptual leap. He said that calculations in ballistics would only be useful for projectiles whose weight and shape made air resistance insignificant. So, an inquiring mind might then ask: “What happens when there is no air resistance?” In other words, the concepts of motion and resistance to motion can be treated separately. Galileo was the first to explicitly deal with motion and resistance to motion separately, and in doing so discovered Newton’s first law of motion – the law of inertia – which says that an object keeps moving at the same speed and in the same direction unless an unbalanced force acts on it. Air is needed to sustain motion. Air resists motion. We’ll calculate in situations where we can ignore it. By ignoring air resistance, we learn a fundamental truth about motion – the law of inertia. The trouble is, he rejects this statement. In Aristotle’s view it must be false, because its falseness supported his assertion that a vacuum is impossible. What a pity it is that Aristotle – having shown the tremendous insight needed to make such an early statement of the law of inertia – didn’t explore its implications further. In 1505, Bartolomeo Zamberti translated Euclid’s Elements into Latin. Zamberti had managed to find a copy of Euclid’s works in the original Greek. The best known previous edition had been written by the Italian mathematician Campanus of Novara in the 1200s. Campanus had translated the Elements based on an Arabic source, adding his own commentary. Tartaglia felt it was time someone wrote a modern, Italian version of the Elements. Also, he detected mathematical errors in the Zamberti and Campanus versions. Certain that Euclid himself did not make the errors, Tartaglia said later versions of the book had been corrupted. Therefore, he felt free to make additions and corrections as appropriate. After all, it was not Euclid’s work he was correcting, but the work of people who had made a mess of things later. Tartaglia produced his own version of Euclid’s Elements, and it proved to be a highly influential work. One of the mistakes he corrected was Definition 5 in Book V of the Elements: this was a mathematically beautiful definition of proportion from the brilliant Greek mathematician Eudoxus. Definition 5 was not just beautiful, it was hard to understand. So hard, in fact, that its meaning had become twisted by botched translations. Tartaglia was a sufficiently powerful mathematician to see what Eudoxus actually meant, and he was the first person to correct the faulty definitions present in all the Medieval Latin editions of the Elements. In 1543, Tartaglia released Elements in Italian. For the first time, the Elements was available in a modern European language, along with Tartaglia’s helpful edits and comments. Tartaglia made geometry available to everyone in Italy, not only the elite university-educated scholars. It was from Tartaglia’s Italian version of the Elements that Galileo Galilei learned geometry. In fact, Galileo was taught geometry at the University of Pisa by Ostilio Ricci, one of Tartaglia’s students. When Galileo founded the new physics, Book 5 of the Elements – ratios and proportions – was particularly useful to him. In addition to his translation of Euclid, Tartaglia made important Italian translations of Archimedes‘ works. Niccolo Tartaglia married and had children during his time in Verona. 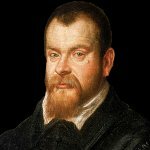 He died in Venice on December 13, 1557, aged 57. The cause of his death is not known, although it is possible his life was shortened by the wounds inflicted on him in his childhood. "Niccolo Tartaglia." Famous Scientists. famousscientists.org. 31 Jul. 2016. Web.